Bill Horgos is available to work with individuals or groups of children or adults. He enjoys sharing his resources and insights. Bill offers a door to times past where we created with our hands. There is not a big investment to get started. Bill is very good at finding old tools and restoring and maintaining them as well as making them himself. This is all part of the process of creating from nothing. 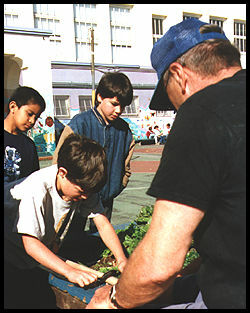 Currently Bill has been working with Ruth Asawa at Alvarado elementary school in San Francisco. They have made many projects including wooden whistles, walking sticks and a mermaid wall illustration from an old part of a boat that washed ashore. Bill does mini workshops in his daughter Bonnie's class in Santa Cruz when he can. Bill is interested in expanding his youth programs if there is enough interest. Bill stresses safety and using tools properly. He also chooses "non-threatening" tools for youth workshops - planers and spoke shaves where the sharp edge is not exposed. Learning how to use a spoke shave. 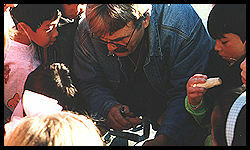 Bill and kids making wooden whistles. 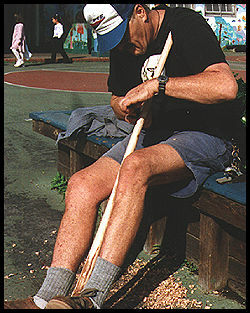 Bill demonstrating work on a walking stick.